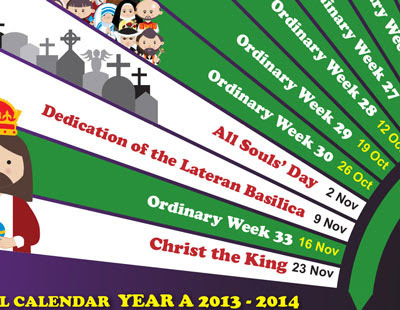 9 November 2014 is now indicated as the Feast of the Dedication of the Lateran Basilica (color: white). It was indicated as 'Ordinary Week 32' in the original calendar. Please note that both old and new versions are acceptable and correct either way. If you have already purchased the calendar, you may download the updated version using the same download link sent to you. Please email me at victorteh(a)yahoo.com if your link has expired. Thank you and I apologize for any inconvenience caused!